Before the US was even a country, before there was even a consideration of gaining independence from England, there were small Jewish communities here. Whether or not Columbus or his crew were Jewish is debatable, but the timing of 1492 certainly supports that possibility. We do know that in 1654, when Portugal recaptured Brazil from the Dutch and and expelled Jews and Protestants, a boatload of 23 Jews sailed into what was then New Amsterdam. A year later, they won the right to settle in New Amsterdam and establish a Jewish community. Communities in Newport, RI; Savannah, GA; Philadelphia, PA; and Richmond, VA soon followed. While it does seem like every day, week and month is special for someone or something, they do present opportunities for discussion and learning. The Torah commands us four times to tell our children of Yetziat mitzrayim, “the going out of Egypt,” and from these verses, the sages who created our haggadah created the narrative of the Four Children. Telling our stories is an essential part of Jewish tradition; we preserve the past to inform the future, and we pass our heritage on to the next generation, and the next, and so on — l’dor va dor. index.aspx, are people with whom we’re familiar — Barbra Streisand, Harry Houdini, Molly Picon and Sarah Silverman — but what about astronaut Dr. Garrett E. Reisman, Ida Cohen Rosenthal and Florence Prag Kahn? 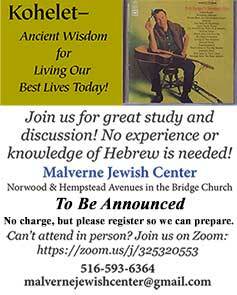 What about those of us reading this article; members, friends and supporters of the Malverne Jewish Center, and people who aren’t yet part of the MJC family? We all have made contributions to the American Jewish landscape. We have kept Judaism alive in our families and our communities near and far, and we will continue to do so, God willing, long into the future.